Not health. Not nutrition. The largest government-funded program teaching our children how to eat “healthy” is teaching them to be afraid — of their foods, their bodies and for their health. And to diet. We often hear the idea dismissed that any potential harm could come from childhood obesity initiatives. After all, what could be wrong with teaching children healthy eating and to be active... for their health? But how many people have researched the ideologies and marketing interests of those seeking government “Healthy Eating and Physical Activity” program grants, investigated what they’re actually telling children, and, most importantly, what our children are learning? The Campaign encourages and teaches children, parents, and caregivers to eat healthy and be physically active everyday. Eat Smart. Play Hard.™ offers resources and tools to convey and reinforce healthy eating and lifestyle behaviors that are consistent with the Dietary Guidelines for Americans and the MyPyramid Food Guidance System. The Campaign spokescharacter, Power Panther, and his nephew Slurp are used to communicate the behavior messages. The Eat Smart. Play Hard.™ materials support the nutrition and physical activity component of School Wellness, add a new twist to WIC education and counseling, and reach Food Stamps, Commodity Supplemental Food Programs, Food Distribution on Indian Reservations participants as well as child, after school, and summer programs. 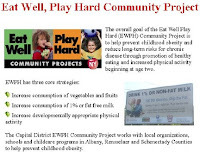 The general lesson plans and materials for the Eat Smart Play Hard childhood obesity prevention programs are provided by the USDA, but each local program puts its own spin on the program. The San Luis Obispo program targets low-income Hispanic children in first and second grades, living in the central coast region of California. It pairs children with an adult buddy and the curricula was compiled from materials from the USDA, Iowa Nutrition Network and Iowa Department of Public Health Pick a Better Snack. Its program is focused on meeting three objectives: eat more fruits and vegetables; limit sugar and drink more water; and teach ways to be more active. The unsound good-bad food messages — shown to put young people at risk and to lead to dysfunctional relationships with food — are unmistakable. Over the six weeks of Eat Smart Play Hard programs, kids aren’t helped to explore all sorts of different foods their growing bodies need and that kids can enjoy and find fun to eat. Nor are they helped to eat normally and to trust that grown-ups are taking care of them and feeding them safe and good foods. They’re given adult worries and complex nutritional concepts beyond their cognitive abilities to know what to do with them, not to mention, a fair amount of questionable diet beliefs. To drive home that not eating right and being active can supposedly hurt them and make them feel and look badly, comics from the USDA have Power Panther telling kids he was weak and slow and the last to be picked by other kids to play... until he started choosing healthy foods and playing hard. He then had a transformation and had lots of energy, started getting better grades in school, and all his friends wanted to play with him. 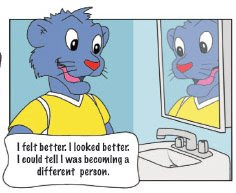 He looked better, too, and became a different person everybody noticed, says the comics. 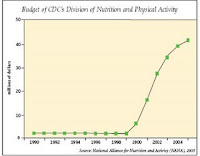 When the government’s latest Dietary Guidelines for Americans, and the Food Guide Pyramid created from them, were released in 2005, it was the first time in history that nutrition was no longer the priority. The new priority was weight management. 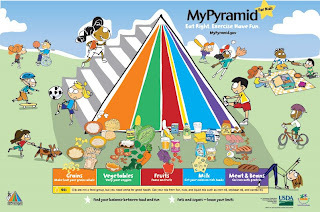 The new Dietary Guidelines put the entire nation on a diet and its key message was to “eat less and exercise more to lose weight.” While the impact on adults was recognized, no one has stopped to look at how the food guide pyramid created for children, MyPyramid, translated these guidelines for children and what the Eat Smart Play Hard education program for the kid’s MyPyramid has been teaching. It’s teaching them to diet. 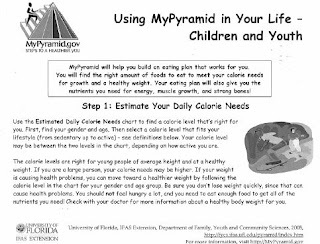 MyPyramid for kids is about weight control and restrictive eating, a point made clear in how the pyramid is to be used to teach kids to “balance their food with fun.” Step One is “estimate your daily calorie needs” to know the right number of calories needed to be a “healthy weight.” It cautions them to “be sure you don’t lose weight quickly.” Of course, the messed up message being given kids is that they are eating “healthy” when, of course, they are actually dieting. 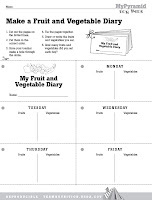 Did you know that the MyPyramid for Kids also has the children learn to keep a food diary? Some of the Eat Smart Play Hard programs use the USDA’s handout, focused on fruits and vegetables. Others, like in New Mexico, have their own food journal forms they give to the kids to fill in. Missouri's Eat Smart Play Hard program focuses on four themes: eating healthy breakfasts; making wise snack choices; balancing food choices with physical activity; and be active every day. “[H]ealthful eating habits is an important life skill that can aid in preventing health problems, such as obesity, diabetes, and heart disease, later in life,” the campaign literature claims. The program literature from San Luis Obispo repeats similar popular beliefs: “Overweight and obesity can lead to a number of illnesses, including diabetes and heart disease... the two common contributors to overweight and obesity are poor diet [and] not enough physical activity.” To kids, public health messages about horrible diseases they don’t understand are scary, especially for the naturally-fat kids. They're left to worry about adult diseases that little kids shouldn’t have to spend their childhoods worrying about. Is this what you would want someone to tell your first grader? • We need 6 to 8 cups of fluid each day, in addition to the foods we eat. • On hot summer days, it is especially important that we get enough water because dehydration can be dangerous for our bodies. • Thirst is not always a good indicator of how much water we need. • Plain cool or cold water is the best for replacing body water. • We need water throughout the day, and before, during and after physical activities, especially activities in the sun. • When you are thirsty, the best drink is water. Of course, needlessly pushing water isn’t about their health or teaching them a healthful eating habit, as the water myths reveal. It's a dieting behavior and an attempt to fill them up so they’ll eat less and consume fewer calories. And another water myth. They’ve even raised billboards promoting a public health message for parents to “skip the fat.” The campaign says that at age two switch kids to 1% or non-fat milk. One reader, photographer Jessica M. Shea, was so shocked, she drove back around and took this picture to share with you all. [Click on image to view larger.] The belief that toddlers and children should be on low-fat diets is controversial among medical professionals and shorter on clinical evidence than most parents realize. [Kids] said they like to eat healthy. “I usually try to get salads at my school,” said an Ocean View Elementary School student... “Eating healthy can change your life and eating bad can destroy your life,” he said. These are first graders, already anxious about if the food they eat is healthy and safe to eat, already dieting and eating salads for lunch, and fearing foods that they believe will destroy their lives. These are little kids being taught vitalism beliefs about raw foods and processed foods, and near magical healthful properties of certain foods — all through a government-funded program. None of these foods will hurt them, but they’re being taught to fear foods popularly believed to be fattening and dangerous. These youngsters are being set up for a lifetime of fears and dysfunctional relationships about eating and their bodies, and worse, jeopardizing their health and well being. The U.S. Preventive Services Task Force has repeatedly found insufficient evidence to recommend counseling to promote healthy eating in adults or children. Similarly, public health messages and interventions to promote healthy eating and physical activity for the prevention of childhood obesity have been shown to lack credible evidence of effectiveness or safety. And even feel-good initiatives to encourage more fruits and vegetables have been shown to be complete flops. A misuse of many hundreds of millions of dollars in public health resources that, if health was the real priority, could be used to provide healthcare to countless underprivileged children. As was recently reported by epidemiologists at Johns Hopkins in Baltimore, Maryland, after 15 years of massive nationwide efforts, the 5-A-Day for Better Health Program has had no effect on getting people to eat more fruits and vegetables. Nor did a review of the body of evidence support the scientific rationale for this national program. The science — which continues to show that, beyond the basic prevention of deficiencies, the near magical benefits being claimed for fruits and vegetables and ‘healthy eating’ aren’t supportable by available evidence — hasn’t slowed support for these programs, either. There are hundreds upon hundreds of organizations and agencies eagerly getting in on the grants to promote healthy eating and fitness programs — funds that have grown 2,000% just since 1999 as part of childhood obesity initiatives. They are not going to be the source of re-evaluating these programs and getting the message out to parents and consumers that they lack efficacy. That may be why we’ve never heard that Eat Smart Play Hard has all the appearances of teaching kids to diet, restrict foods and control weight by purging calories. Shouldn’t programs targeting disadvantaged and fat children be grounded in good science and actually shown to help them — with demonstrated benefits that outweigh the potential harms? Don’t all children deserve that much?